When the Chicago Bulls traded Luol Deng away to the Cleveland Cavaliers ,like many other people, I thought that the Bulls were tanking. Now with the NBA season close to being over we all know that the Chicago Bulls are doing the exact opposite of tanking, this team is balling. 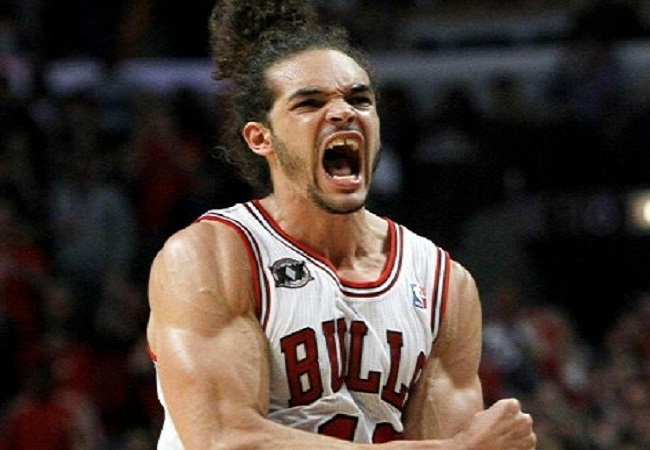 This team being lead by the impressive play of Joakim Noah continues to be a defensive juggernaut. As well as defending this team has also upped their offense which features 6 players scoring over ten points per game. Like any other year the Bulls have been a great defensive team but this year seems even better with the teams two main offensive threats (Derrick Rose and Luol Deng) not suiting up for them for most of the year. With the playoffs right around the corner, the Bulls might be the team to watch out for. When we look at the teams in the playoff picture right now, nobody but the Miami Heat and Indiana Pacers (who have struggled as of late) scare anybody in the Eastern Conference. With that said, that leaves the door wide open for an upset. The Bulls might just be the team that can do that as having a strong defense is a great way to win games. Also having Joakim Noah running the offense and making plays for every one has the team looking really good. Out of all the teams in the East, the Bulls are probably the one that can do some damage. While a team like the Raptors or Nets have a good chance of getting to the second round, the Bulls are the team to watch out for. Joakim Noah is a legit MVP candidate right now and the team is striving. If the Bulls pull an upset don’t be surprised, this team is surprisingly legit.